Seemingly a whole lifetime ago, I worked for five years in the office of a wholesale bakery and I have to say, the smell of yeast has been and still is one of my most favorite smells of all. I loved walking through the production area in the early afternoons as the baking staff began their daily preparations; I loved standing by the enormous mixing bowls as hundreds of pounds of bread dough, pungent with the scent of yeast and flour, spun and smacked around inside. It was a happy day indeed when my boss would inform me that they would be making test batches that day because I knew he would be bringing me endless samples of warm bread to critique. And the best perk was free bread for the taking- crispy baguettes that snapped when you broke them, showering golden shards of crust everywhere, tangy sourdoughs, pillowy stirato loaves, rustic wheat breads and a mouth-watering marble rye that was my favorite sandwich loaf. The best lunch I could indulge myself in was a sliced baguette spread with a little of their scratch aioli and a few slices of salty ham. I was in carb heaven. I still miss the amazing bread, and it’s been a very long time since I last walked through those doors. I can buy the loaves in the grocers, and the flavor is still good, but I miss the experience of picking up a loaf off the rack that was only hours out of the oven, ethereal in it’s taste. I still love really good bread and for a long time I routinely spun loads of flour, water and yeast in my bread machine, so much so that I managed to effectively kill the thing outright, but I’m happy to have gotten my money’s worth. Since then, which was quite a while ago, I haven’t made a lot of bread from scratch despite having the time and the desire for it. I experimented with this amazing no-knead bread and loved the rich dense crumb and tangy flavor, but I am plagued with a ‘Must Have It Now’ mentality sometimes, and this just doesn’t work well with the patience and time required for a good loaf of scratch bread. There are some high quality artisan bakeries in the Twin Cities, including my old employ, and for a short trip in the car I can pick up a few loaves of bread to indulge myself in, but what I really need to do instead is lose the impatience inside of me and buckle down to make myself a good loaf on a regular basis. On a recent trip through the library, I came across the publication of a local group called The Saint Paul Bread Club. I barely hesitated before slipping the slim book off the shelf. It’s basic and fundamental, nothing glossy or fancy, just page after page of bread recipes from a local group of passionate bread bakers, along with plenty of insider tips and hints to making better breads at home. After a few perusals and some thought to the first loaf to try, I rolled out of bed on a particularly gloomy morning after a simply pathetic night’s sleep and all I could think about was the smell of yeast, a warm glowing oven and the taste of a fresh warm loaf. The weather promised everything from rain to an eventual accumulation of upwards of 6″ of snow. It instilled in me both a bluesy melancholy, and a fierce need for the routine of baking, the rhythmic kneading and the promise of carbohydrates. This loaf contained bulgur and millet and I had both on hand. Bulgur is cracked and parboiled wheat and really simple to use- it requires little else but a soak in hot water. 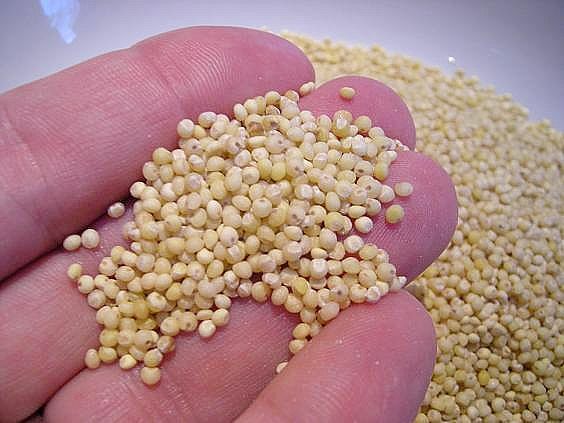 Millet is a hulled, wheat-free cereal grain- the outer husk is removed leaving tiny yellow balls. 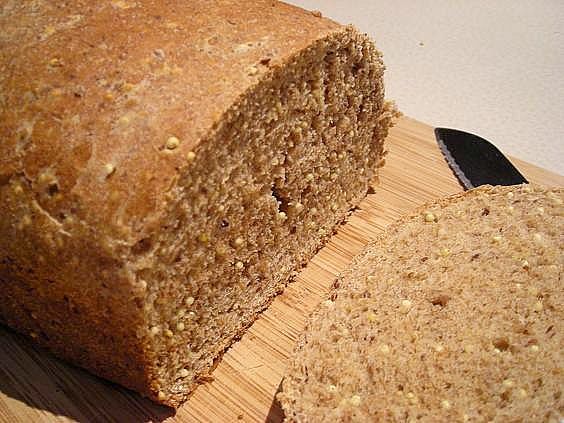 Millet requires cooking, but this recipe didn’t make any mention of pre-cooking the grain so I didn’t, and it plagued me on whether or not this would result in a tooth-cracking slice. It didn’t. This recipe started with a sponge- honey, warm water and yeast were whisked together until foamy, then stirred with whole wheat flour, bulgur, oil and salt and allowed to sit until all puffy and fragrant. I mixed in the bread flour and millet, and pretty soon was faced with a coarse hairy blob of dough, and tiny grains of millet popping all over the kitchen. It seemed like hours before I stopped feeling their little hard knobs under my feet, even with obsessive sweeping. But the magic of kneading kicks in- and magic it is- taking a rough and craggy blob and transforming it into something smooth, elastic and uniform, dotted with the tiny yellow points of millet and smelling alive and warm. The rest is your basic bread instructions; rise until doubled, punch down and allow another rise (which I skipped for time purposes) shape the loaves and place in a pan, rise to double again and then bake. I won’t bore you with instructions. And somewhere along the way, amidst all this tactile interaction and flour/yeast transformation, a tiny sliver of light knifed through me, lifting the melancholy, driving it far away. Was it the nap I took during the first rise? Maybe. It likely was something else altogether; the bread making lifted my spirits, even with the late winter storm blowing hard outside and the yeast saturated me with it’s own little charm. It could have been the workout I gave my arms and shoulders as I kneaded, driving a much appreciated blast of endorphins into me, or it could have been the fact that a hands-on loaf of bread is a thing of beauty. It transports you back to a simpler time, before cellophane loaves were the norm, where you watch a few pantry staples work a magic trick right before your very eyes. It’s nearly impossible to bury yourself in the blues with that happening in front of you. And the taste….well, that’s enough right there to lift your spirits. This loaf was moist, a nice dense crust and crunchy little bites of millet throughout. It made awesome toast too- to me, the best indicator of a good bread. I’m thinking that I need to buy this little bread book. Make a sponge by dissolving honey and yeast in warm water in a large bowl; let stand until bubbly, about 5 minutes. Add whole wheat flour, bulgur, canola oil and salt and mix until smooth. Cover with plastic wrap and let rise for about an hour, or until doubled in size. 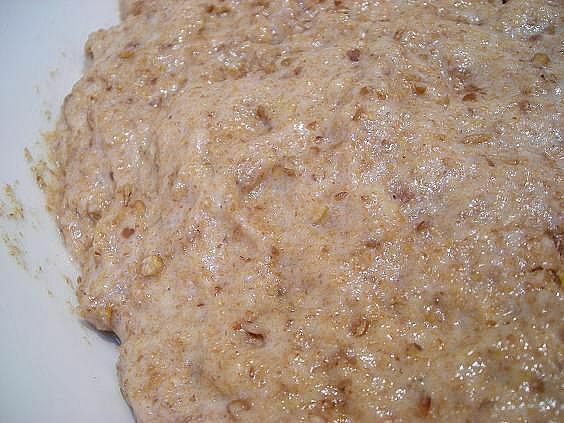 Stir in millet and bread flour until a firm dough forms. Turn out onto lightly floured surface and knead until smooth and elastic. Place in oiled bowl and turn to coat top. Cover with plastic wrap and let rise until doubled, about an hour. Deflate dough, cover and let rise again until doubled. 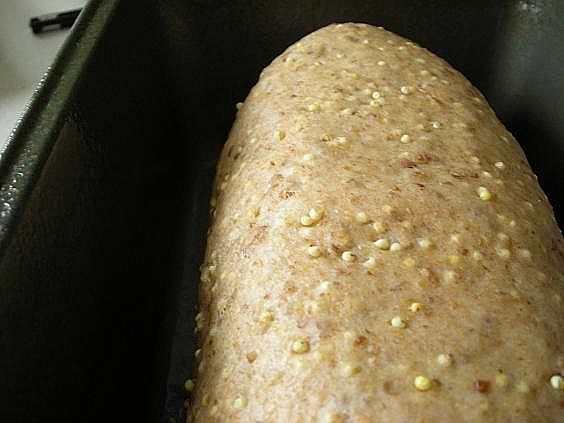 Deflate, cut in half, shape into loaves and place in oiled loaf pans. Cover with a towel and allow to rise until doubled, about another hour. Preheat oven to 350. Bake loaves for 40-45 minutes or until nicely browned. Turn out onto wire racks to cool. 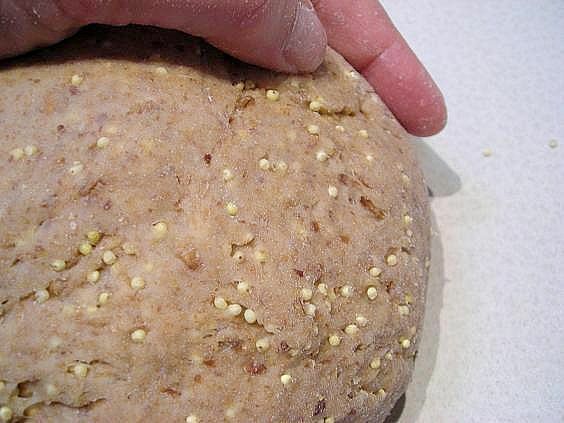 After the sponge is formed, and before the bread flour and millet are added, the book states that the dough can be placed in the refrigerator overnight. If this method is used, remove the dough from the fridge and allow to warm up for at least two hours before adding bread flour and millet. I skipped the second rise and just went ahead and shaped the loaves, placing them in the pans for a second rise as I didn’t have the necessary time. I don’t see that it hampered the end product at all. Now THIS looks like bread! I love the smell of freshly baking bread too – they should bottle it and sell as an air freshener. Actually wait no – I hope Glade isn’t reading this! Bread is my weakness. Bread in its many forms is my go-to for the feel goods. These pictures are a little mean spirited. I look and almost lick the monitor. That is bad, bad form.